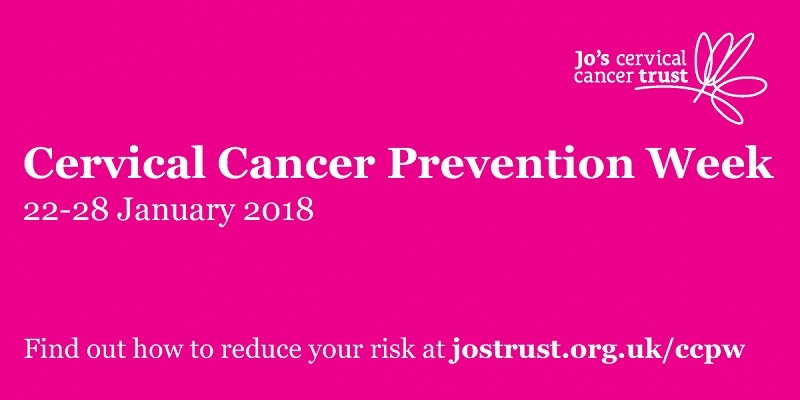 Just a reminder that this week is Cervical Cancer Prevention Week 22-28 January 2018. The theme for the Cervical Cancer Prevention Week 2018 is “Reduce your risk”. Cervical cancer can be prevented. With your help we can ensure every woman knows how they can reduce their risk of the disease and the steps they can take to look after their health. We want to see the day when cervical cancer is a disease of the past. Join us this Cervical Cancer Prevention Week to get closer to that day. Hold an awareness day in your office, business, university, GP surgery or community centre: You can order free materials to display and hand out.